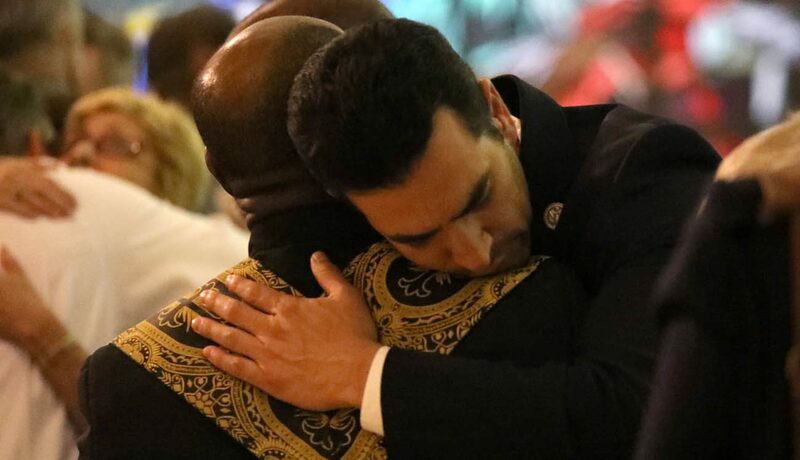 “And in the face of violence, we stand together because we cannot let hate and violence have the last word,” he said in his remarks at the evening service. “We come together in unity across our religious traditions, across race, across gender to stand with each other as living signs of that hope,” Bishop Pepe said. The service at the cathedral brought people together as they were still trying to fathom what had occurred barely 24 hours earlier: A crazed gunman, later identified by law enforcement officials as Stephen Craig Paddock, 64, showered a crowd of about 22,000 attending a country music festival in a venue on the Las Vegas Strip the evening of Oct. 1. From his perch in a room high on the 32nd floor of the Mandalay Bay casino resort hotel, he fired off hundreds of rounds of bullets down on the crowd below, ultimately leaving at least 59 people dead and more than 500 injured. It is the worst mass shooting in modern U.S. history. Once police had located the shooter, SWAT team members burst into the room to find Paddock dead from self-inflicted gun wounds. “I am struck by the signs of goodness even in the face of violence. I think about the first responders who risked their own lives to save the lives of others,” Bishop Pepe said in his remarks at the cathedral. “I think of the emergency medical personnel and hospital staff members who answered the call for well-being and a future by using their skills to save lives. And, I am reminded that the many individuals, who rendered aid, gave rides and helped each other. “They are living reminders of the good Samaritan and God who calls us all from fear to care,” he added. He said the prayers that evening “for healing and unity in our community of Las Vegas,” reminded him of all the places in the world where people suffer violence every day. “We must find ways to work together to bring about healing in our world so that none of God’s children have to suffer what we have suffered,” the bishop said. Among civic leaders at the cathedral service was Steve Sisolak, chairman of the Clark County Commission, who praised the police for their quick response and commended the outpouring of support from the community. “Las Vegas will never be quite the same as a result of this,” Sisolak said. But “we’ll be back,” he added. Sisolak started a GoFundMe online drive to raise money for the shooting victims and by midday Oct. 3, contributions had reached more than $3 million. His original goal was $500,000. Other examples of community support included people lining up for hours to donate blood for hospitals treating the shooting victims. By the evening of Oct. 2, the blood bank capacity had been reached. Two resort hotels offered free rooms to people arriving in town to help family members affected by the shooting; Southwest Airlines was offering some free flights. A Catholic church right next to the concert venue, the Shrine of the Most Holy Redeemer, was used “as a staging area and an initial place of refuge,” Father Bob Stoeckig, vicar general of the Diocese of Las Vegas, told Catholic News Service in an email Oct. 1. He added that “there were bullets near the doors” of the shrine, which is a popular place for tourists to attend Mass. There were no reports of damage to the shrine.